MK Metallfolien produces and delivers high oxidation resistant, ferritic high grade steels that retain their geometry and anticorrosion properties at temperatures as high as 1200 °C. With a minimum thickness of 0.025 mm and a melting point of about 1500 °C, this metal is a metallurgical masterpiece that is equalled only by the very few in the world. The high corrosion resistance and dimensional stability are safeguarded by the high aluminium and chromium content combined with rare earth elements. Drawing from experience we have gained from 25 years of cold rolling and our patented developments, we can refine the alloys we use on a continuous basis. This knowhow for high temperature applications enjoys international acclaim from all leading manufacturers of catalytic converters for automotive OEMs, construction and agricultural machinery, and diesel particle filters. Our current offers includes two alloys and an aluminium coated material that differ in their max operating temperatures: CrAl-SCR remains oxidation resistant and dimensionally stable up to min 850 °C; CrAl4 (1.4725) up to min 1000 °C; and CrAl6 (1.4767) up to min 1200 °C. 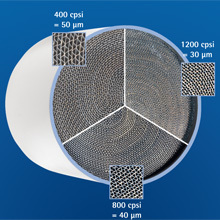 Details on catalytic converter materials can be found on our data sheets, available as a PDF file for download.